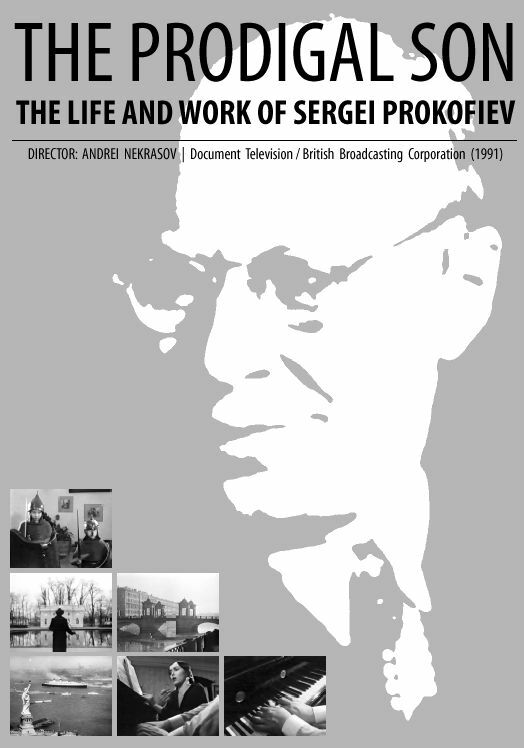 To those familiar with Serge Prokofiev’s long and short autobiographies, the bulk of his musical catalogue, and the letters of Stravinsky, Eisenstein, Diaghilev, and other luminaries in Prokofiev’s circle, Andrei Nekrasov’s documentary The Prodigal Son, The Life and Work of Sergei Prokofiev (1991) will seem like a strangely familiar friend, a visualisation of events one has often imagined oneself, rendered with a dual sense of literalism and impressionism. A Russo-British co-production boasting an apparently healthy BBC budget, Nekrasov’s semi-documentary interweaves re-enactments of episodes in Prokofiev’s life, concert performance sequences with Valery Gergiev and the Mariinsky (Kirov) Orchestra, and sometimes rare stock footage with voiceover narration taken from autobiographical writings, the latter a device employed recently in Peter Rosen’s Khachaturian (2003) to bitterly tragic effect. While Nekrasov’s highly cinematic use of filters, slow motion, baroque costumes, shock cuts, and multiple narrators (1) raises it several notches above rote television documentaries, the familiarity that at first endears the film ultimately becomes its greatest liability. Though the film succeeds in poeticising the composer’s “official” life, it adheres closely to publicly known facts and parrots widely held opinions, stopping well short of deconstructing, revising, or subverting many presumptions that have long jaundiced perceptions of Prokofiev on either side of the Atlantic. (1) The film uses both diegetic narrators (representing the voices of Prokofiev, Lina, and other characters who appear in the dramatised episodes), and a non-diegetic (objective) narrator who relates historical details.